This is from a couple of weeks ago. The poor little thing was getting mobbed by a flock of seagulls and finally settled on the wall close to me. I must have seemed less threatening than the gulls. Are these considered parrots? Over here they are called cockatiels. 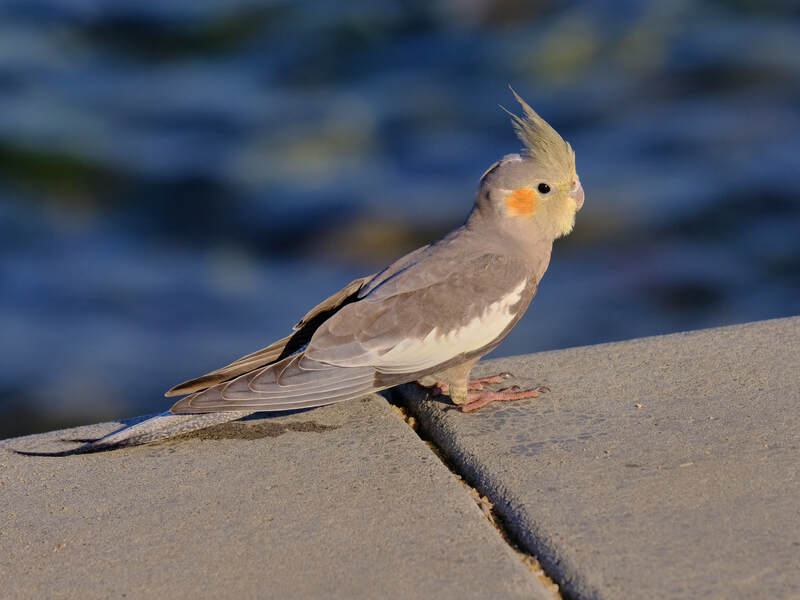 They also go by the name crested parrot here, but you are right, it is a cockatiel (Nymphicus hollandicus). A few from a recent trip to Sydney. Landmarks - all in one picture! View from small park further back - a nice little pocket of green and peacefulness among the city bustle. Through the blinds - as we sat down for dinner, the setting sun was visible through the blinds and created a nice painterly image. It was a bit of a challenging trip with quite a bit of disruption on the way up - my first flight was cancelled before I even set out to the airport, the replacement got as far as Canberra before circling for about 90 minutes then returning to Melbourne and after a bit of waiting again to get rebooked I got home around 11pm before the third flight at 7am on Saturday morning eventually got me there. This morning I found a bit of time and managed to get back to a location overlooking the Melbourne skyline to try and recreate some shots I took a little of 8 years ago. The comparisons are interesting both in the changes in the cityscape and in the cameras available to me. And the newer image - a slight crop of a 24Mpixel image taken with a Fuji X-E3 and 18-55. On a recent Australia Day outing, I had a chance to give the Fuji 55-200 a bit of a workout with the various sea birds along the beach. Hooded Plovers which often result in sand dunes along our coast being off limits due to their ground level nesting. Pacific Gull - these are big, and whilst I have cropped this a bit, the wingtips just dip out of the frame - the following frame with the wings in the upper position had the tips just out of the top too! Silver Gulls these are the most common along our coast and seemed to have found something interesting in the top of the bush as they were frequently gliding in, landing and then taking off again. The Australia Day public holiday marks the end of the summer holiday period here in Australia, with people heading back to work and kids back to school. We took advantage of the long weekend to have few days out - one to the hills and the other to the coast. The trip to the hills involved some cycling along the Warburton Rail Trail - around 40km of disused railway line no used for cycling, walking and horse riding (We didn't do it all). We also took a drive up to the summit of Mount Donna Buang and a brief walk around the rain forest tree top trail. The coast trip involved a bit of time on the beach at Flinders and some stops along towards Cape Schank. Lone Tree - Whilst sitting on the beach, this lone tree on a distant headland attracted my attention. Unfortunately by the time I realised the shot I wanted, the tide was coming in and I couldn't get close enough, even at 200mm, so I've had to crop. Lone Tree B&W A B&W version also appealed to me, although it is a bit hazy. Perhaps an excuse for a return visit. Camera: Fuji X-E3, Lenses: 27 f/2.8, 18-55 and 55-200.